I have a problem. It’s this recipe I invented for cookie dough. It’s addictive and I have had it, ahem… for breakfast the past two three days. But only a little bit at a time, with fruit. I swear. Can’t. Stop. Eating it. 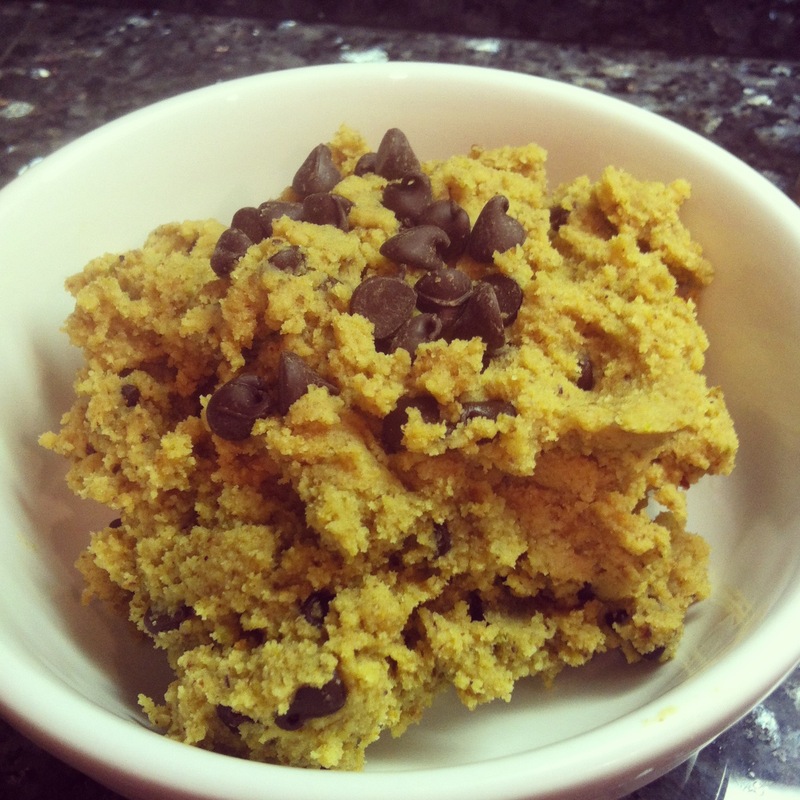 Anyway, to avoid the sugar, wheat and all the unnatural ingredients that cookie dough normally contains, I came up with this recipe over the weekend (as I was making a recipe from OMG it’s Paleo? called 5 Ingredient Avocado Pudding.) I made the pudding with the idea that Andy and I would use it as a dip for bananas and apples. The recipe called for chocolate chips, and it made me think of chocolate chip cookie dough and a possible recipe for that… we could dip the fruit in that, too! Oh joy! The secret in the cookie dough is Mehjool dates. They’re probably one of my biggest indulgences (60 calories apiece!). Not only do they give the dough sweetness, they also provide a molasses/caramel flavor. And, for diehard Paleos, I have made it two ways. Some people don’t believe in using butter at all, some people don’t eat any legumes at all. I myself, enjoy organic garbanzo beans once in a while. So, review the recipes below and tailor them to your own needs. 🙂 Each one serves 2-4 people. Enjoy. This entry was posted on May 15, 2013 by cavegrrl. It was filed under Recipes and was tagged with chocolate, cookies, dessert, paleo, primal, recipe, TCHO.